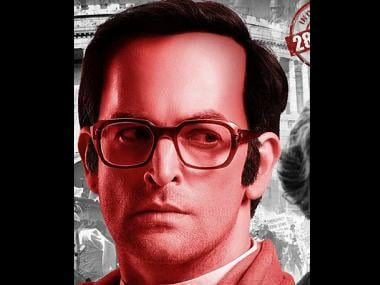 Indu Sarkar begins with disclaimers — a whole array of disclaimers. It then launches into its opening sequence: the police have come to Mubipura village. They take all the male residents into custody, then announce: "Nasbandi ka saath do!" The men try to hide behind locked doors, but the police beak them down. Those who protest are lathi-charged. "Meri nasbandi kyun kara rahe ho?" a 70-year-old asks. So does a 13-year-old. We then see a shot of Connaught Place. A banner flutters here, bearing the legend: "Avoid loose talk and rumours. Do your duty." 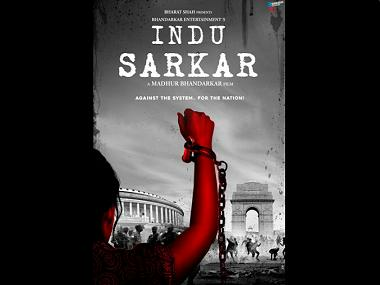 The poster of Indu Sarkar. tell her that she must marry, handle the home, produce children. That's what Indu grows up with. She also has a speech disorder — a stammer — that further wrecks her confidence. Indu wants to marry and 'settle down', but she is rejected by several prospective grooms. We also see Naveen Sarkar (Tota Roy Chowdhury), who is an aide to a minister called Omnath (Satyajit Sharma). 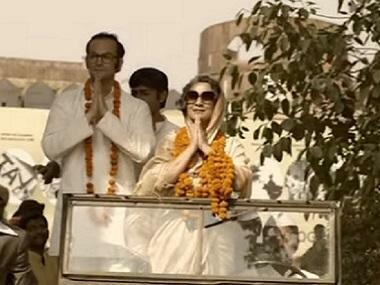 Omnath himself serves under a prime minister who looks exactly like Indira Gandhi, but who (post-Congress workers' protests) is merely referred to as Mummyji, by her son (Neil Nitin Mukesh, channelling Sanjay Gandhi) who also is only referred to as 'Chief'. Indu begins to visit a speech therapist in a bid to get rid of her stammer. She also meets Naveen and they 'click'. Post-marriage, Indu becomes Indu Sarkar. Crisis enters their married life when Naveen chalks out a plan to demolish a basti — even the homes of those residents who voted for the government — under the orders of Omnath and Chief. A word here about Neil Nitin Mukesh who is a sheer delight to watch on screen. From his mannerisms to his acting and dialogue delivery — he is pitch perfect. While the basti is being demolished, Indu happens to be passing by. She sees the police opening fire on the residents and killing many of them. She comes across two lost children and brings them home — a development that irks Naveen. He asks Indu to get rid of them; when she refuses, marital strife ensues. In her attempts to trace the children's parents, Indu meets several activists who're engaged in opposing the totalitarian government and its policies. Indu also meets Mekhla, an activist ho has lost her son to polie aids during the national Emergency. "Ek goli ne mere 6 foot ke ladke ko 6 inh ki tasveer bana di," she tells Indu, in hat is one among the many instances of crowd-pleasing dialogue in this film. Meanwhile, Indu discovers Naveen's role in the demolition of the basti, and leaves the home, later filing for divorce. She also comes across an activist who runs a group called Himmat India Sangathan — Nanaji (Anupam Kher) — who helps her discover her political conscience and exhorts her to help lead the country to freedom from its tyrannical government. With so much of the focus on Indu, it's a pity that Kirti Kulhari isn't at her best in this role. She seems stiff and mechanical and isn't able to bring the effortlessness to the role that her character requires. The detailing of the film, however, is another plus point. There are lots of references to the 1970s: Songs from Bobby and Aradhana, SD Burman LPs, women sporting the 'Sadhana cut', the Commonwealth Parliamentary conference. The art direction and set design is too competent. The placement of songs — with the choice of lyrics — also seems to be very apt at certain points in the film. Although there are a few sequences where one wishes the editing could have been better. We can't get into too many details of the story without giving away essential plot points. Suffice it to say that Indu ends up in a courtroom, having to make an impassioned stand for the right to freedom of speech and expression. Having already done this before in Pink, Kirti Kulhari aces this bit. 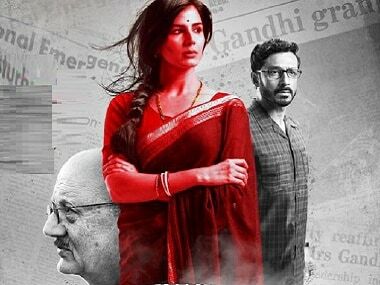 One expects a film like Indu Sarkar to have a strong impact. And it builds up like that — before fizzling out. On seeing it, one understands what director Madhur Bhandarkar meant when he said it's '70 percent fiction and 30 percent truth'. The fuss made around the film in the run-up to its release also becomes a little difficult to comprehend — it certainly doesn't show anything we didn't already know about. The title of the film worked in its favour, as one was led to believe that the film was about Indira Gandhi's government, whereas it's really about Kirti Kulhari's character. Bhandarkar overdoes the symbolism in some places — which perhaps is the director's trademark. The film, very vaguely, seems to be made through a right-wing lens. Moreover, if he wanted to make a fictional story with a female protagonist, then he should have created a more powerful setting for her. The intensity of Indu gets lost amid all the attention given to the Emergency. In summation, great performances by Tota Roy Chowdhury and Neil Nitin Mukesh, but certainly not Kirti Kulhari's best act yet.